"Sam Clear’s epic walk around the globe is a stark and moving reminder of the presence of our loving God in every human heart, no matter their race, their culture or their creed." A story like nothing you've ever read before. Listen to Fr Richard Ross at the Australian Youth Festival as he launches walk4one - Paving a Path to Unity! On ‘one given Sunday’, a young Tasmanian pledged himself to a mission: Samuel Clear would walk around the world—yes, the world—in an effort to urge and inspire all Christians to unite. That they may all be one. Between the snakes and pumas and scorpions and wild dogs, between the gun-toting maniacs and knife-wielding thieves and racist homicidal drivers, between the thirst and pain and electric shocks and hospitalizations, between terrorist interrogations and KGB shakedowns … Sam finds the beauty and the love and the generosity of spirit in the ordinary people of the world—and discovers that unity means much more than just a name on a parish sign post. Walk with him, and share the journey. Teaching and learning activities designed to be used alongside Sam Clear's autobiography walk4one: Paving a Path to Unity. Inquiry based learning activities based around three key themes: Community and Identity; Trust, Love and Faith; and Environment, Obstacles and Politics. Each topic within the themes is linked to an in-depth author interview. 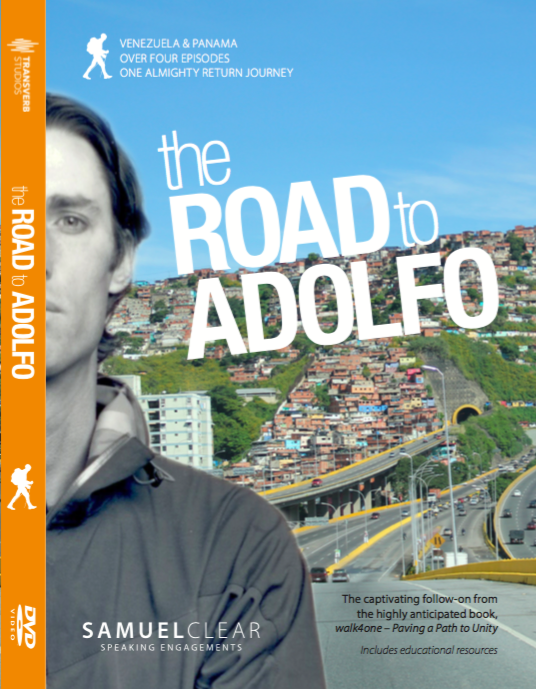 The first five minutes of The Road to Adolfo documentary. Sit back and enjoy! Available from Parousia Media, or direct at Sam Clear speaking engagements! "Fabulous examples of authentic family life and their intense connection and pride of their country….. A great opportunity to immerse yourself in an amazing culture." Sam's journey may have finished, but the journey needs to continue each year for hundreds of young Australians! Culture College can help create for your high school or university the immersion program of a life-time. The dedicated team will provide you with an experience saturated in Educational exchange, immersion & adventure with the capacity to truly change each participant. Book Sam for a keynote or interactive workshop today.